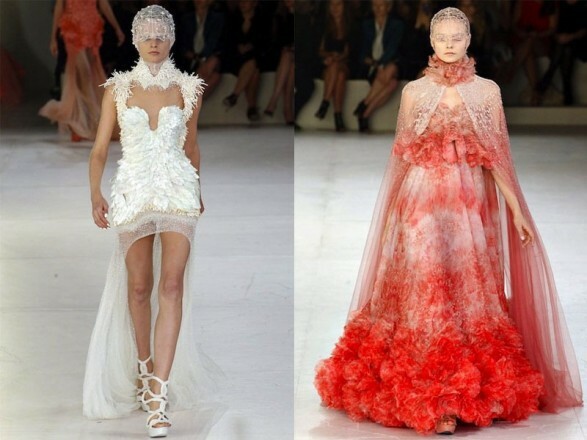 If Alexander McQueen we make a spontaneous visit could not be prouder the work that has made the new designer at the head of the firm, Sarah Burton. And her Spring-Summer 2012 meets all the requirements to carry its label (madness Fantasy, work and delicate) but turn an aura that makes them unique (and most of them wearable!). In the first collection no breath during the first few seconds, for fear that the essence so characteristic of McQueen had gone, that’s not happening today. People trust your creative and not for less (Lady Catherine did her wedding day and their subsequent appearances). Clothes full volume, Necklines and more elaborate than are their reasons for being. Although as in all models are just facts for the bravest, Ie Lady Gaga & Cia. All we ever dreamed of a sheathed gorgeous dress, Those that are only available to very few. These could serve for some of your dreams. McQueen noted for his madness and how to dress women. Sarah has not dropped, and while most of his collection is the most wearable, makes an ode to the late designer.